COMPATRIOT attributes our editorial team and contributors as the tip of the arrow that spearheads the success of COMPATRIOT. A magazine written by Africans for Africans and the world, by people who believe in spreading the gospel of good news! The message this magazine carries, is more than just a message. It is a news revolution set to captivate the mindsets of it’s readers, who will participate as mouth pieces of Africa’s positive story to the world! Secondly, COMPATRIOT presents a palette of positive news, and strives to deliver this as the face of the magazine. Lastly, the magazine is not industry-specific, it’s reader-focused! The magazine caters to the high-end reader traveling first class to Abu Dabi for a new business venture, or the self-made millionaire relaxing in the luxury of a hotel lounge on holiday, or the entrepreneur on his way to a conference to network. COMPATRIOT caters to the diversified lives of its readers, their passions, and professions! It isn’t an entrepreneurial magazine for the entrepreneur, or a sports publication for an athlete; COMPATRIOT satisfies the woman and her life, the man and his interests – it speaks to the person. 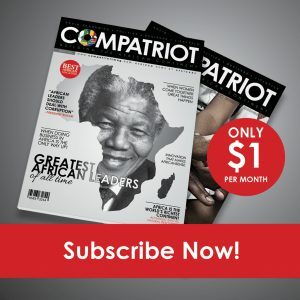 If you would like to send through any press releases or advertise with us please kindly email adverts@compatriotmag.co.za and we will gladly send you our rate card. Do you want to advertise on Compatriot Magazine? Fill in the form below for additional details.